Grandfather Wanbdi Wakita & Grandmother Pahan Pte San Win share knowledge, protocols and hands-on learning for individuals who want to feel more comfortable to enter Indigenous community and Ceremony. This will be a lovely, renewing day of deep learning, a one-day retreat with group discussion, great food and time to journal and walk-in nature. A holistic time to relax your mind and body and expand your heart and spirit. Who? Teachers, professionals and community members who want to learn more about Indigenous Culture, practice and perspectives. Participants will gain cultural competency and the confidence to enter and participate in Indigenous Community. When? 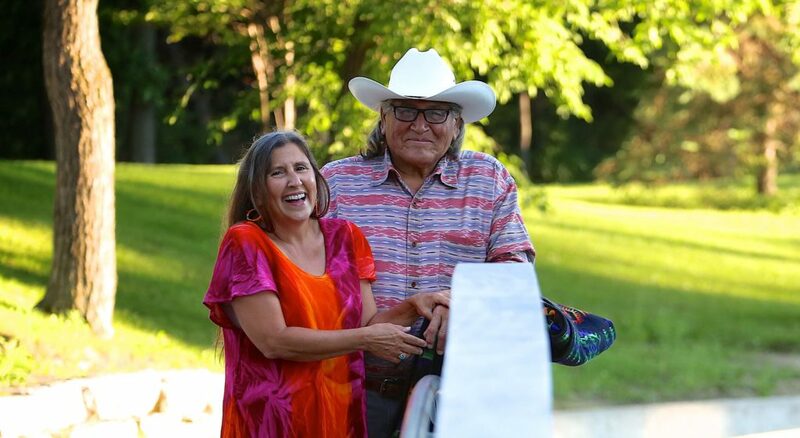 Saturday, April 13, 2019 9 – 5 p.m.
Wanbdi Wakita, a Wicasa Wakan or Holy Man, is a residential school survivor, counselor and storyteller who has spent a lifetime making prayers for people. He possesses a rare breadth of traditional, cultural and sacred Knowledge. Pahan, a Sundance Leader, is a Spiritual Caregiver and storyteller who has provided counseling support to residential school survivors, traumatized women, incarcerated men and youth. She shares teachings of Love and promotes unity among nations. Suggestions of what to bring? Comfy clothes and moccasins or slippers, a blanket & pillow, warm outdoor clothes, a journal, a long skirt or ribbon shirt if you have one, (offerings such as a pouch of tobacco & 1 meter of blue broadcloth – *optional), your stress and burdens to leave there and take home hope, inspiration and renewed energy. Protocol – Listen more than talk. How & when to offer tobacco? Protocol – Offering to the water. Give thanks. Pray 4 times before we eat the food.